A report coming out of Japan indicates Mazda is busily developing the next performance-focused Mazdaspeed3. Aimed squarely at the Volkswagen Golf R, the next Mazdaspeed3 will reportedly be powered by a turbocharged 2.5-liter four-cylinder Skyactiv engine tuned to generate approximately 295 horsepower. Mazda recently ran into problems turbocharging the high-compression Skyactiv engine but an inside source told Japanese magazine Holiday Auto that engineers have solved the issue. The 2.5-liter's power will be transferred to all four wheels via a six-speed manual transmission, and a Skyactiv-Drive gearbox might be offered as an option. A track-tuned suspension and upgraded brakes on all four corners will keep the power in check. Visually, the Mazdaspeed3 will wear a considerably more aggressive look than the stock Mazda3 thanks to a full body kit consisting of a deeper front bumper, side skirts, a trunk-mounted spoiler and an air diffuser integrated into the rear bumper. Large alloy wheels mounted on low-profile tires and a functional hood scoop will complete the sporty look. The 3's interior will be upgraded with bucket seats for the front passengers, a meaty flat-bottomed steering wheel and Mazdaspeed-specific instrument cluster that will provide a full panoply of information about what is going on under the hood. More details about the upcoming Mazda Mazdaspeed3 will emerge over the coming months. The hot hatch will be unveiled at a major auto show in 2016 and go on sale around the globe shortly after. 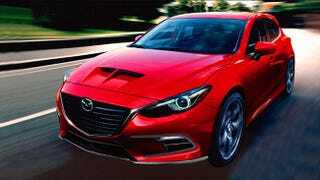 Read more: Next Mazdaspeed3 to pack 295 hp?Next Mazdaspeed3 to pack 295 hp?Next Mazdaspeed3 to pack 295 hp?